Nathalie Tzourio-Mazoyer is research director at the CEA and manager of the GIN-IMN team. Neuroimager, she is particularly interested in the understanding of the neural bases of hemispheric specialization of cognitive functions, such as language. MD (1984 Cochin), she completed a master of neurosciences (Pitié-Salpêtrière 1987), then specialized in nuclear medicine (INSTN 1987-1989). As such, she participated in the Frédéric Joliot hospital department in Orsay in the development of neurofunctional imaging techniques and their application to the study of cerebral bases of cognitive functions. 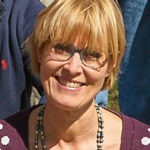 Founding member of the GIN (1989), alongside Bernard Mazoyer and Marc Joliot, she continued her activities in Caen (Cyceron), where she coordinated cognitive neuroimaging and then in Bordeaux since 2010. Her work deals with the study of the anatomical and functional bases of hemispheric specialization in relation to the inter-individual variability of cognitive skills and is based on the most recent neuroimaging methods. In particular, she has coordinated the acquisition of a multimodal database dedicated to this issue (BIL&GIN), including 453 participants (half left-handers) including both anatomical and functional imaging data together with an exhaustive evaluation of participants’cognitive skills. Co-author of more than 150 scientific publications, her work received more than 13,000 citations. She developed the atlas AAL, 2nd of the most cited publications of the CEA and 1st of neuroimaging. She was awarded the Seymour Cray Prize in 1993 and the Dagnan-Bouveret Prize of the Academy of Moral and Political Sciences in 2002.